Mr. Vogt's P.E. Blog: Welcome To The New P.E. Blog! Welcome To The New P.E. Blog! Hello and thank you for checking out the first edition of the new Glengary P.E. Blog! 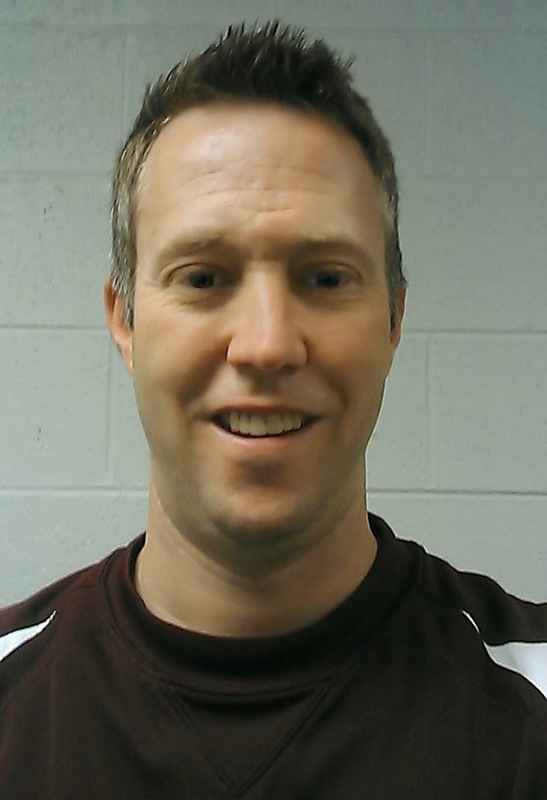 My name is Bob Vogt and this is my 15th year of teaching Physical Education with the Walled Lake School District and my second year at Glengary. I am married with two great daughters Natalie and Grace, who are third and first grade students in the Walled Lake School District. When I am not teaching I enjoy spending time with my family, camping, and staying active by riding my bike, running, and playing softball. I enjoy teaching elementary physical education because I feel that the lessons the students learn now can have a positive impact on their health for the rest of their lives! *Mrs. Grinnell also teaches at P.E. at Glengary. She is here on Thursday afternoons and teaches first and fourth grade once a week. Mrs. Grinnell is looking forward to sharing some information about herself in the next blog entry! Students recorded each of their times/scores on our Fall Fitness Test sheets. These scores will be kept and compared to their final spring fitness tests to show how much they have improved throughout the year! 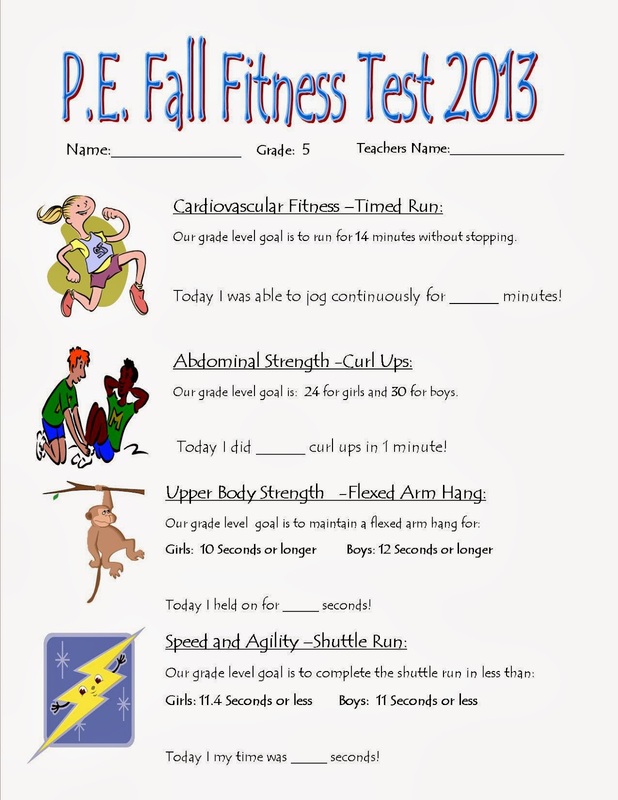 Below is an example of a 5th grade fitness test sheet. While all of the 2nd-5th graders were working hard on their fitness tests, the students in Kindergarten and First grade learned about movement and personal space. They played games and participated in a variety of activities that helped them to be aware of their bodies and moving through space. K-1 students also spent time learning and practicing motor skills like running, hopping, skipping and galloping. After completing all of the fitness testing, the students in grades K-5 all participated in a unit on Soccer and Kicking. Grades 3-5 learned soccer skills such as foot dribble, in-step kick, passing, and offensive/defensive strategy. These skills were implemented in games like Sideline Soccer, Knock Out, Number Soccer, and 4x4 Soccer. Toward the end of our unit, students even got a chance to go outside to play soccer during P.E.and enjoy some of the last nice weather days of the fall. During this unit, students in grades K-2 learned about dribbling a ball with their feet. We focused on learning cues like: 1. Dribble with sides of feet 2. Control the ball by keeping it close (don't just chase it!) 3. Eyes looking forward to see the field. We spent lots of time practicing dribbling a ball by playing games like Shark Attack, Pin Dribble, and Soccer Pirates. We also focused on kicking the ball with an in-step kick for power and distance. Students learned to kick the ball with the laces of their dominant foot in games like Number Soccer, Team Kickball, and Home Run Derby. 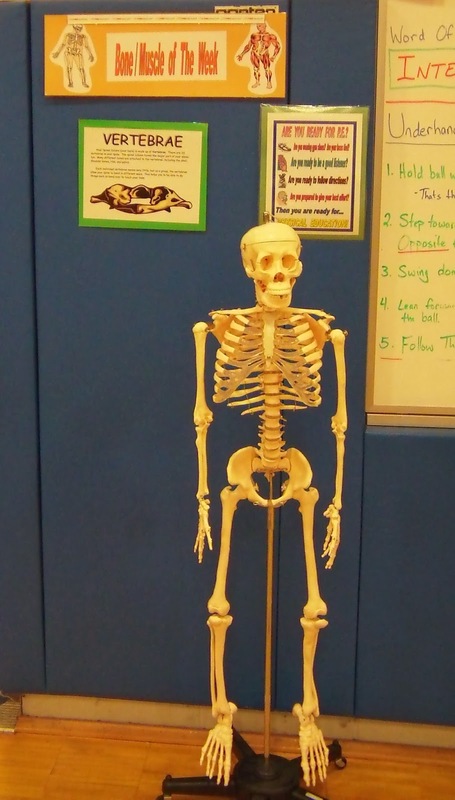 Twice each month we typically end our classes by spending some time with Mr. Bones! We use our model skeleton to learn about the bones and muscles in our bodies. This week classes learned about their VERTEBRAE. Students learned that they have 33 vertebrae that make up their spinal column. They learned that each of these bones can bend or twist slightly to allow their body's to bend, twist, and move. We also learned that one of the most important functions of our vertebrae is to protect our spinal cord from injury. Recently, the Michigan Legislature passed legislation which requires that all athletes AND physical education students have a signed concussion awareness form on file in order to participate in athletics and/or physical education. Many of you have already signed and returned this form to Mrs. Maten our school secretary. But if you have not yet filled out a concussion form, the link below will take you to a site where you can download/print the form. Please fill it out and return it to Mrs. Maten as soon as possible so that your child doesn't miss out on any of their P.E. time! Click below to see some of our great Glengary Gators working hard during P.E.! Fantastic Mr. Vogt! I enjoyed learning about what the Gators do for PE! This is soo nice! thank you! Nice work. Thanks for the great slideshow. Awesome Mr Vogt!!! Thank you! This is terrific Mr. Vogt! Thank you for all you do! Thank you for doing this! Now that Eleanor has started school it seems we have so little time with her between school and bedtime. It is nice to see what she is up to and that she has yet another great teacher looking out for her and her classmates! Thanks again! Gators rock and so do you Mr. Vogt! Thank you. That rock climbing wall is amazing! Thank you for the beautiful slideshow and for taking such an interest in all of the children. It is so much appreciated. Thank you for sharing Mr. Vogt! It's always great to see what the kids are doing during the day!! Looks like the kids are having a lot of fun in P.E. And I love that you're teaching them with Mr. Bones. Keep up the great work! wow. is gym boring now,,we used to play kick ball, dodge ball, hockey , basketball, soccer and football in gym. now they are running in place for 8 minutes? Not sure if this a curriculum of choice or if its force fed now as the new initiative to pamper kids. Anonymous - Our students do not jog in place for 8 minutes. Our timed jog is a continuous jog. We practice on occasion by jogging around the gym or outside on a nice day. And each year as the kids get older, an additional 2 minutes is added to their jogging time. So by the time the students are in 5th grade, they are expected to jog for 14 minutes without stopping. The students are taught the the basic skills needed for sports, games, and lifelong physical activities. Our lessons also focus on the importance of health and fitness though a wide variety of fun games and activities including the sports you mentioned above.